We thought it would be done by now, but we're not there yet. As I mentioned yesterday, installing the glass panels was a little trickier than expected, and the guys worked painstakingly slow all day Saturday. But I think they've got the hang of it now and I'm hopeful that they will be able to finish up on Tuesday. Progress as of Sunday morning. Glass panels are installed on the right side, part of the top and part of the front. I just barely remembered to get a "before" shot. The awning over the back door was already removed by the time I got down there with the camera. No matter; I have plenty of photos of the back of the house in my archives. The "before" shot, after the awning over the door was removed. The wisteria got cut back some after this was taken. The frame went together relatively quickly, including assembling the base, digging holes for the concrete footings, and bolting the thing to the back of the house. I really think we're going to like it once it's ready for plants. I'll post more photos when it's done and we get some plants in there. The "during" shot from the same spot as the "before" photo. The watering can and bucket are there so we won't walk into the glass. Work should be starting on Wednesday for replacing our shower stall. Which reminds me, I've got to take some "before" photos in the bathroom! Here's my last photo from Châtillon-sur-Indre. We walked up the main street into the center of the old town toward the ruins of the castle and keep. You can just glimpse it in the back, with the national flag flying over the donjon (keep). This street leads to the main square below the castle keep. The assembly of our greenhouse slowed down to a snail's pace on Saturday. The guys were having a lot of trouble installing the glass windows. Apparently the rubber joint strips that hold the glass in the aluminum frames were very difficult to manipulate in the chilly autumn weather. They got fewer than half the window panels in, and will be back on Tuesday to, hopefully, finish up. I'm keeping the rubber gasket strips indoors at their request, so they will be warm and more malleable when the guys start up again. 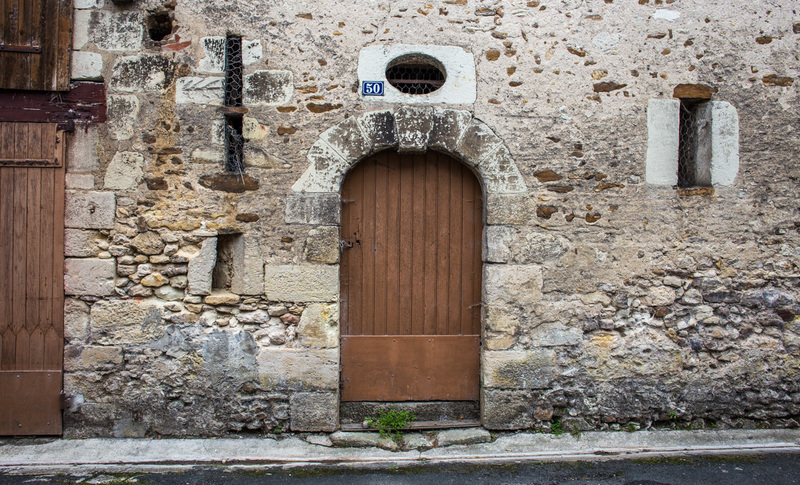 This is another photo from Châtillon-sur-Indre that I took last week during our brief post-lunch walk around town. I didn't take nearly as many photos as Ken did, so be sure to check out his blog if you want to see more. The paving stones are amazing! 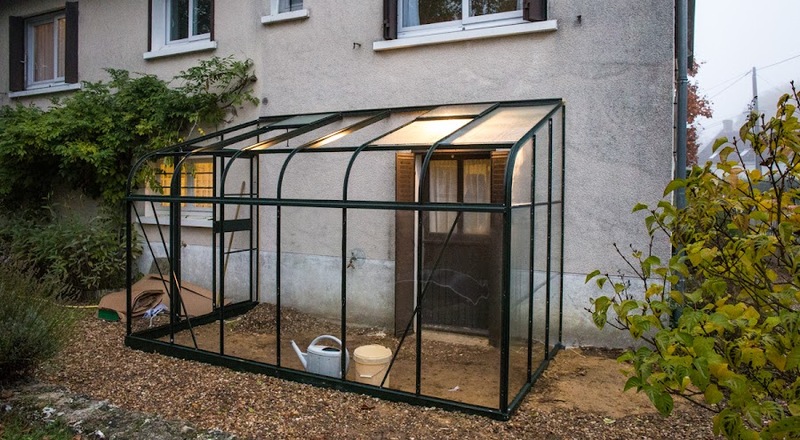 As I mentioned in the "Newsiness" section, we're expecting the garden contractor back this morning to complete the assembly of the new greenhouse. The frame has been up since last weekend. Today they will be installing the glass panels and making whatever final adjustments need to be made. It's getting to be time to start bringing plants in for the winter, so we're very excited about it all! This photo is about a week old. It's been way too foggy in recent days to get the same shot showing how much more orange and yellow the leaves are now. I'm hoping to get some shots before it all goes brown and the leaves drop, but it will depend on the fog. Looking generally eastwards, toward the Cher River valley. We had some minor computer issues on Thursday that took a couple of hours to mess with. First, my inkjet printer is on the outs. It's producing an error message telling me it needs to be looked at by a service technician. That's something that will likely cost more than a new printer and, given the printer's age, may not be worth it. Then, the laser printer seems to have died. After much trial and error, we think we figured out that the printer was interfering with our internal network, causing all kinds of little headaches. It's now been removed from the circuit and the network seems to be working normally again. We have a third printer that's working, so that's ok. Ken is looking on line for a new color printer. The question: inkjet or laser? We shall see. 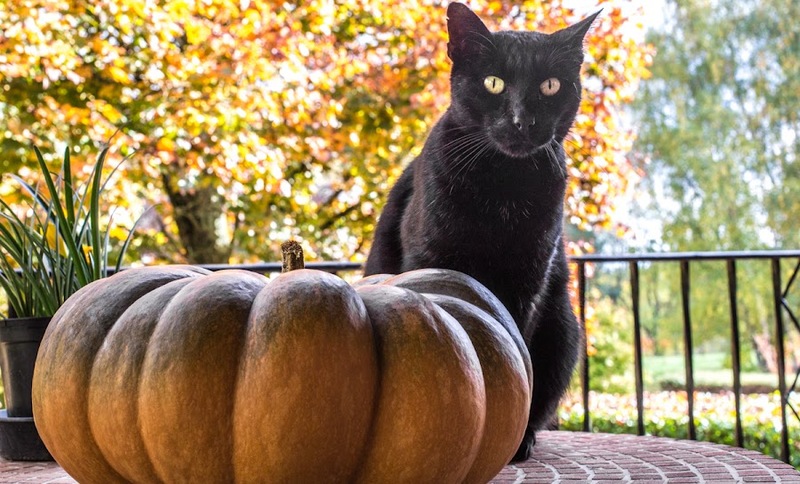 Bert the black cat is doing his best to get into the Halloween spirit. Here he is posing next to one of the pumpkins from our garden. You can tell he's into it. After two or three photos, he high-tailed it out of there. Bert says, "Happy Halloween!" Can I go now? Halloween is not celebrated here like it is in the US. The holiday is November 1, called la Toussaint, or All Saints Day. It's a day off from work, and many people will take a long weekend, or even a week, for vacation. Kids are off from school for two weeks. It's the last gasp before the big holiday season coming up. 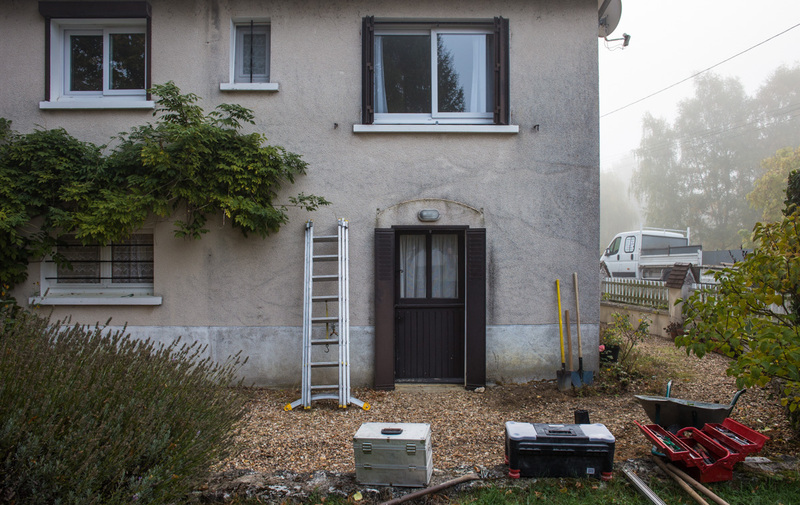 The window openings in this old building in Châtillon-sur-Indre are lined with what we in the US call "chicken wire." I'm assuming that it was put there to keep wild birds out and not to keep chickens in. Pigeons and other birds can really make a mess of empty building if they find their way in. There look to be some breaches in the bird defense network. Our contractor has finished his work until Monday. 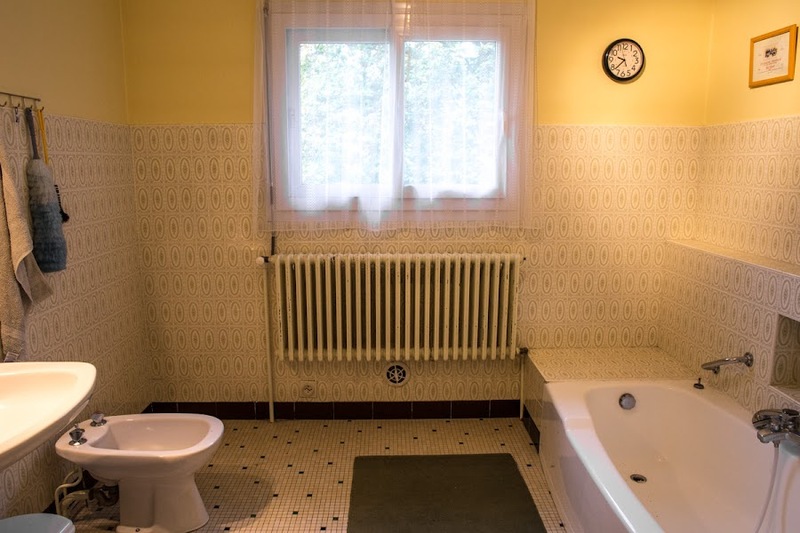 In addition to installing the towel drier, he also replaced the faucets and drain on the bidet and installed a second outdoor spigot on the back of the house. We wanted a new spigot because the existing one will be inside the new greenhouse, which is impractical for outdoor use, so a second one outside the greenhouse made sense. On Monday, he'll start the plumbing work for the new shower. Work on the greenhouse is expected to conclude on Saturday with the installation of the glass panels. Fortunately, our weather forecast is for dry days through the weekend. 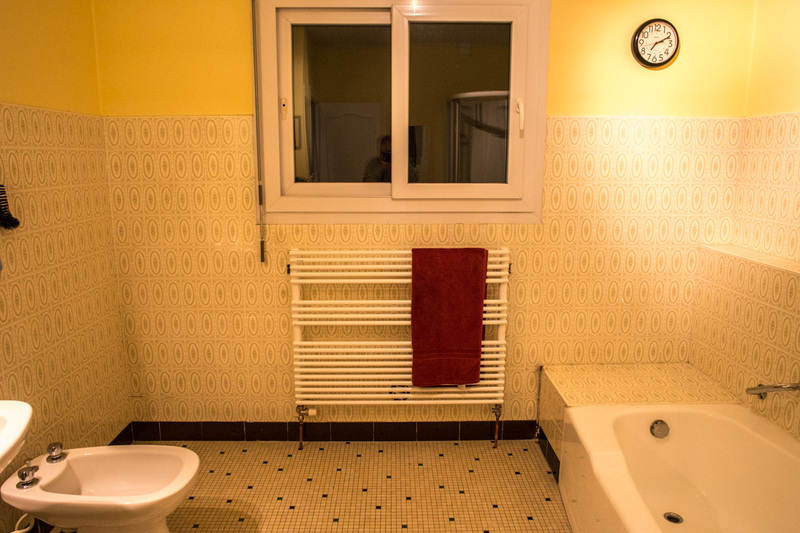 I've been calling it a towel warmer, but in French it's called a towel drier, and rightly so. The goal is to have dry towels on cold winter mornings. Nothing is worse than a cold and clammy towel, right? And now the new towel drier is installed and working. Yay! The plumber finished up the hard work on Monday. Before photo. The old radiator. There were some unforeseen issues, like a leak in the main line after he had to mess with it. It's "only" fifty years old, so some problems are to be expected. He had to replace a section of the main line with new pipe. If you're wondering why the time on the second photo is earlier than the first, I took the second photo on a different day. Ha! During photo. The old radiator is gone. But all seems to be well. 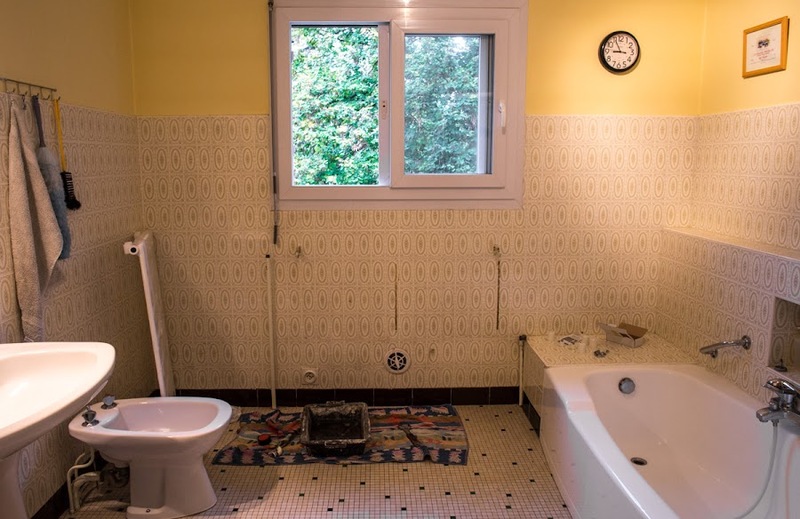 Next, he started on replacing the hardware on our bidet, which you can see on the left in the photo. The new faucet handles are fabulous. Where once the water trickled, it now flows. We still have a little problem with the drain plug, but he's working on that. Installed and working! The supply & return pipes on the bottom will eventually be painted white. Work on the shower will start on Monday next. The plumber's truck had a little problem last week when the transmission failed. So he's getting that fixed on Thursday. He doesn't want to start the shower until he has the full use of his truck (with all the supplies and tools inside). So Monday it is. It hasn't rained very much at all this month, continuing a dry trend since the beginning of summer. But today it's coming down. It started spitting a little on Sunday evening. This morning we woke up to actual rain and it seems that it will last a few hours before tapering off. That'll be good for the ground. 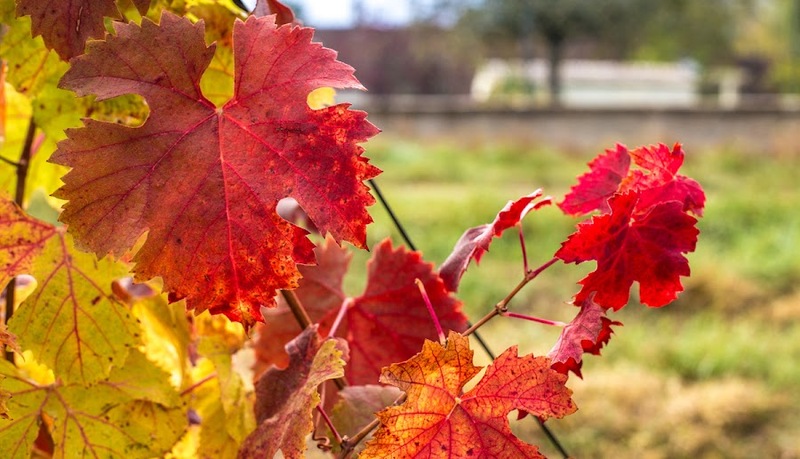 Some more orange and red leaves among the grape vines. The plumber comes back this morning to finish the towel warmer installation. All he has to do is connect the two pipes to the main line and test the system to be sure it's working. Then there's some finish work, mainly filling and grouting where he removed old pipes and filling in the holes in the floor around the new pipes. After that, we need to talk to him about his schedule for the rest of the work, namely the new shower. Alluding to a time past, that is. 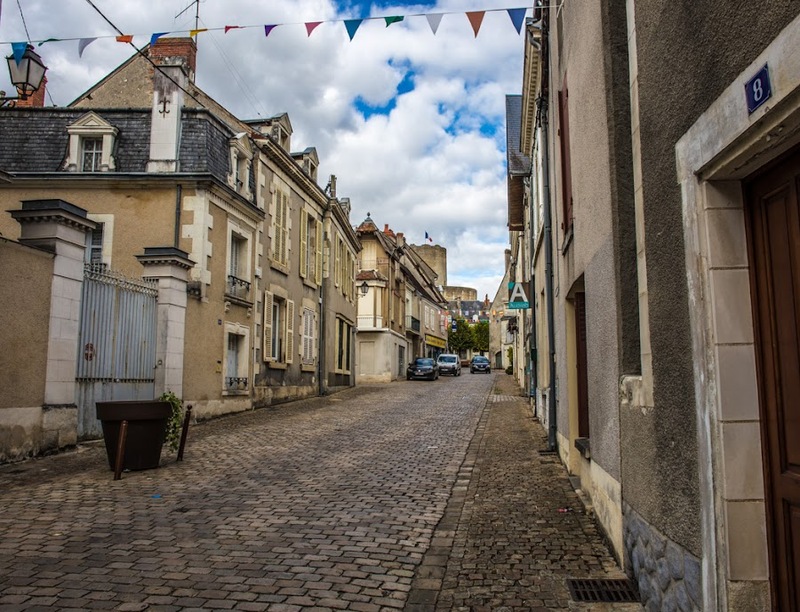 If you read Ken's blog, you know that we were in a town called Châtillon-sur-Indre one day last week for lunch. After lunch, we took a short walk around the center of town. It's a pretty place, but kind of sad. Most of the businesses that once thrived around the central square are gone. 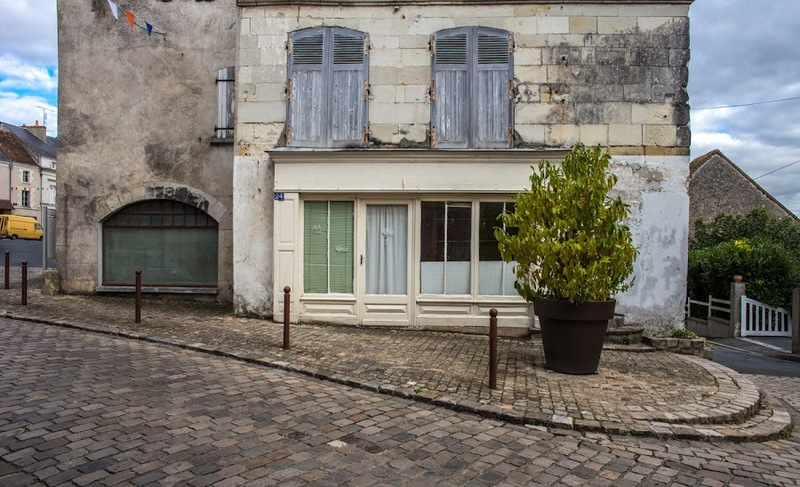 Stores stand empty, except for a bakery, a second-hand shop, a newstand, and a café or two. The town has lost much of its population over the past decades. 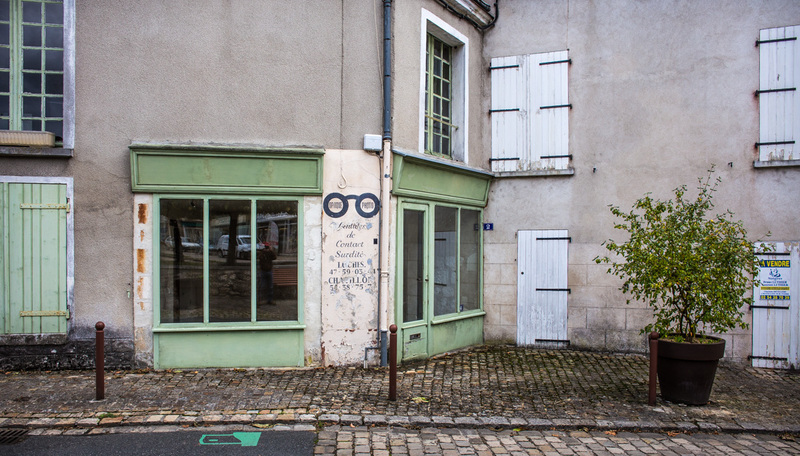 A now-defunct optical shop on Châtillon's main square. The shuttered building next door is for sale. The landscape guy and his dad showed up Saturday morning to start work on assembling the greenhouse. They worked until just past sunset (!) before packing up for the day. They put most of the frame together and poured the concrete footings. They'll be back next Saturday to finish up the frame and install the glass panels. It looks like a complicated job, but they seem to be doing it well. 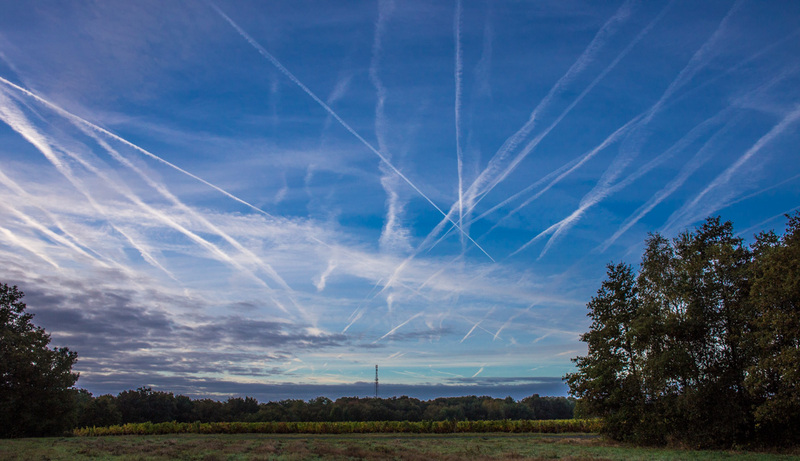 I noticed quite a few contrails in Wednesday morning's sky. We are under a major north-south air corridor and there are always jetliners high overhead. Paris and London are more or less due north of us, not to mention Brussels and Amsterdam. Southern destinations include Marseille, Toulouse, Bordeaux, Barcelona, Madrid, and cities in Italy and North Africa. Looking roughly south over the vineyard parcels. Work on the towel warmer got under way bright and early Friday morning. The old radiator is gone and the new one is up, but it's not connected to the system yet. The contractor has the new pipes fitted, but he hasn't yet connected them to the main line. He'll be back on Monday to finish up. We really like how the bathroom looks with the bulky old radiator gone, replaced by the sleek tubes of the new towel warmer. We're taking photos, of course! 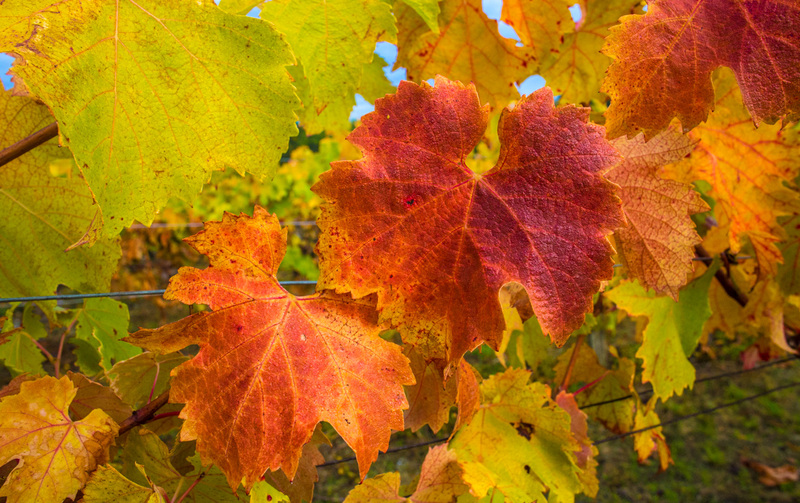 While most of the vineyard parcels out back turn yellow and orange in the fall, some of them go red. 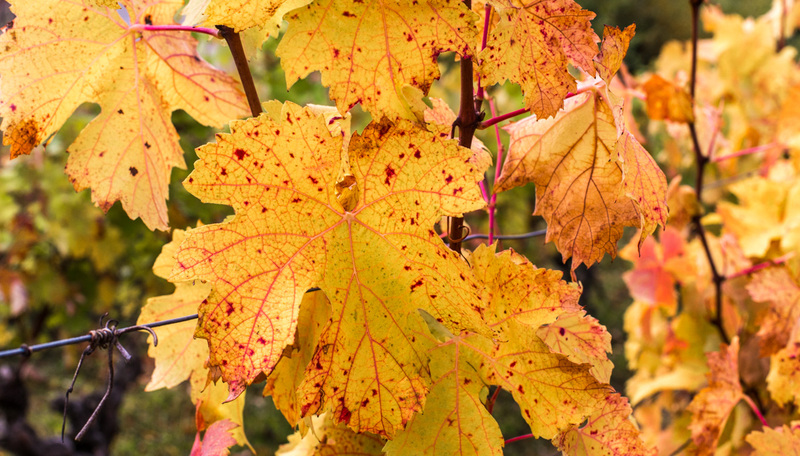 But, even among the yellow and orange, there are some vines that sport red leaves. I'm at a loss to explain why. But it's pretty. Red leaves among the yellow. We're ready for work to start in the bathroom this morning. I've taken the "before" pictures, although I nearly forgot to. In fact, I only remembered after I had moved things out of the room. No matter. If everything goes well, the new towel warmer will be installed and plumbed in by the end of the day. Here's a wide view of the back of our house from the vineyards. Things are still pretty green, but the grape vines and trees are taking on a more yellow hue, with some reds and browns around. Although you can't see it in this photo, the maple trees on the other side of the house are starting to go from their deep red color to a much brighter orange. A month from now the leaves will all be on the ground. Looking toward the northeast and the Cher River valley. Today is prep day. I need to get the bathroom ready for the contractor to start work on Friday morning. For now he'll just be removing the old radiator and replacing it with a towel warmer. But there is a bunch of stuff that needs to be moved out of the room. Then I plan to prepare a fire in the wood stove so we can just light it in the morning. We don't want the heating system to come on because the contractor needs to drain all of the water out of it to remove the radiator. I was surprised during my morning walk with Callie on Monday to see a lot of color change in the vineyards behind the house. 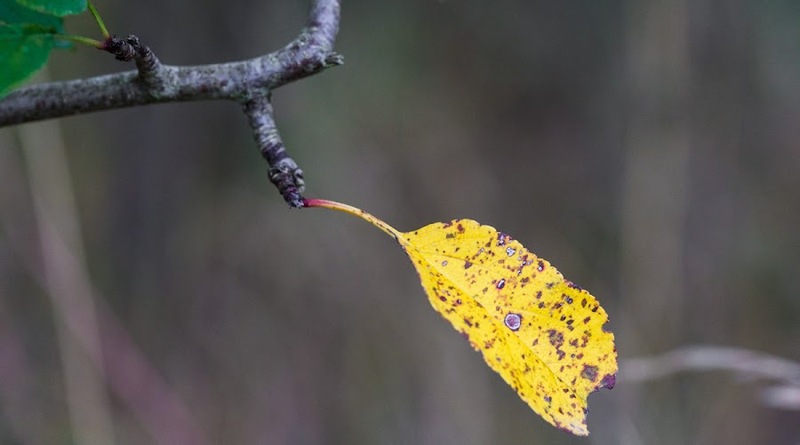 There were, at first, a few leaves changing here and there. But now there are whole parcels that are going yellow and red. I didn't have the camera with me on the walk but I went back inside to get it when we got home. I think this may be either cabernet or grolleau, but I'm never certain. We got a call on Tuesday from the contractor who will be doing the bathroom work. The new towel warmer is in and he will come to install it on Friday. Yippee! There will, of course, be before and after photos. I noticed that the leaves and vines have all withered. 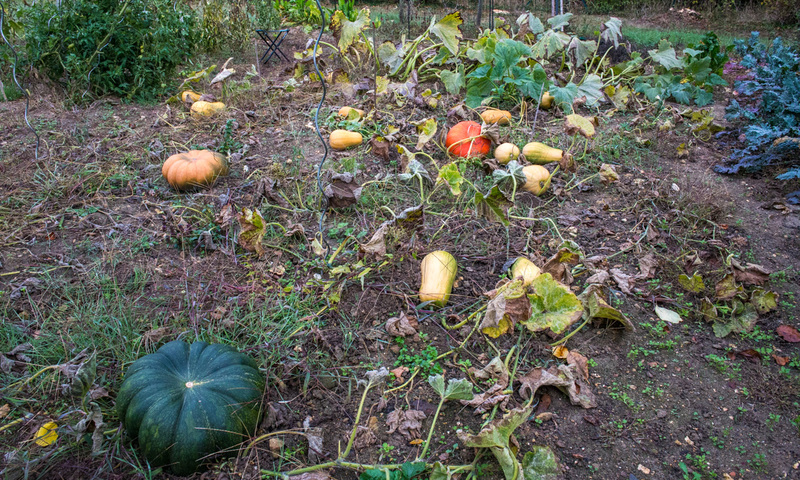 All that's left are the pumpkins. Three of them. We have one rouge vif d'Etampes (vibrant red Etampes) and two courges musquées (musk pumpkins). The rest of the squash are called sucrines du Berry and look very much like butternut squash. The beige and green pumpkins on the left are the same variety. It's time now to get them up off the ground, I think, and start eating! We've talked about a pumpkin soup for now, but there will be other things, too. We enjoy squash simply roasted and seasoned as a side dish. I like to make pumpkin pie and pumpkin-stuffed ravioli. I'd welcome any of your ideas for using pumpkin in the comments section. Here's the spot where the old toaster oven sat for a few years. Now it's canisters filled with dry goods. There's white sugar, spaghetti, raisins, tea bags, wheat semolina, millet, barley, and whole wheat flour. 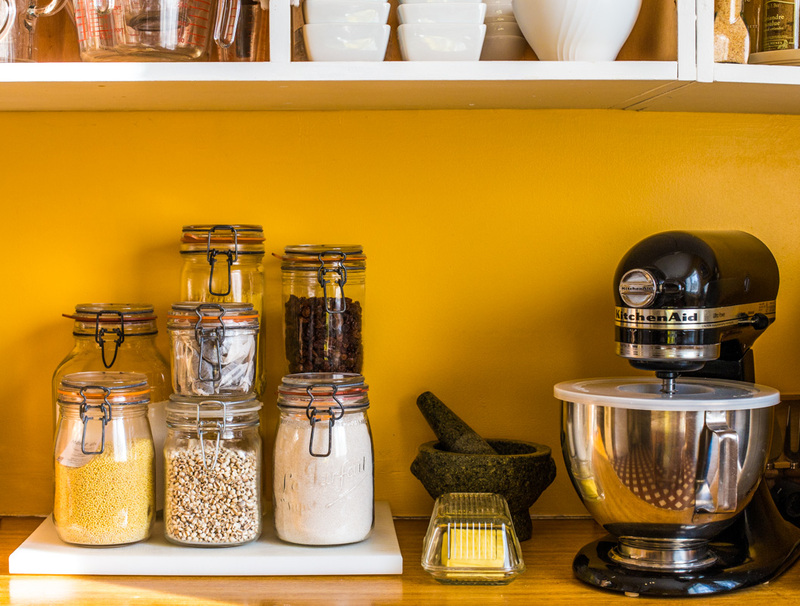 These are just a few of the old canning jars that we use for storing things around the kitchen. There may be rain today. I can see it coming toward us on the radar feed, but it more or less breaks apart as it gets close to us. As usual, we're on the "line" between rain and no rain. We're in a place that's difficult to predict. 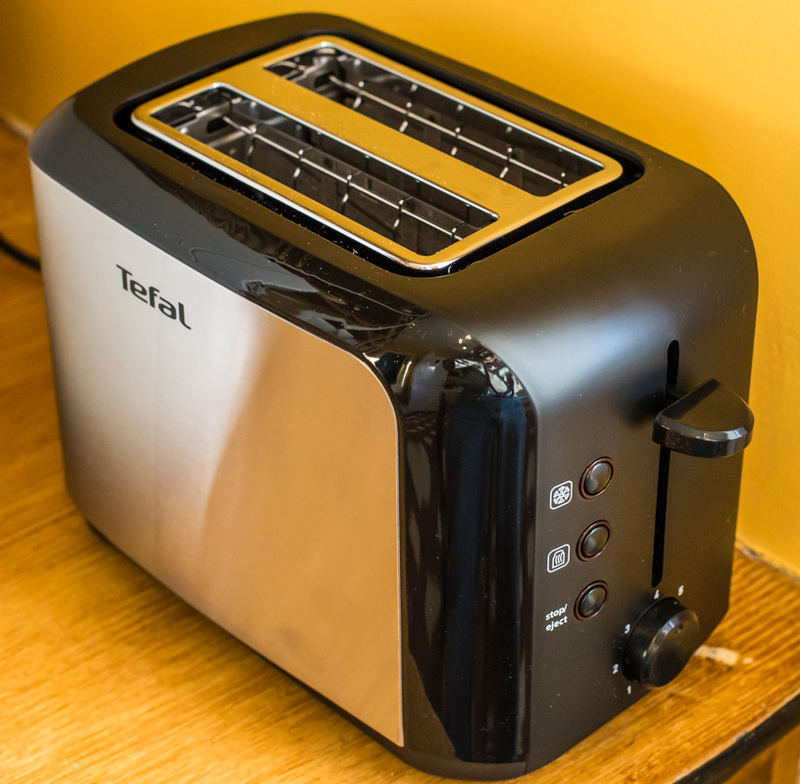 Our new toaster arrived on Friday. So far, so good. It's not a fancy model. I saw some SMEG toasters on line; who spends over one hundred euros on a toaster? Tefal is a good French brand, known for their cookware (we have a few Tefal frying pans) and small appliances. The name comes from combining the words "teflon" and "aluminum." The company is now owned by SEB, another French manufacturer of small appliances. I forgot to brush off the crumbs before I took the photo. Sorry about that. It's working pretty much as you'd expect so far; no defects. The fat slots make it easy to toast baguettes. And it's easier to regulate than the toaster oven it replaced. I'm thinking of making a batch of English muffins today. I'll also make some bagels again soon. They all make good toast. Oh, and, by the way, today is this blog's eleven year anniversary. Or blogiversary, as it were. 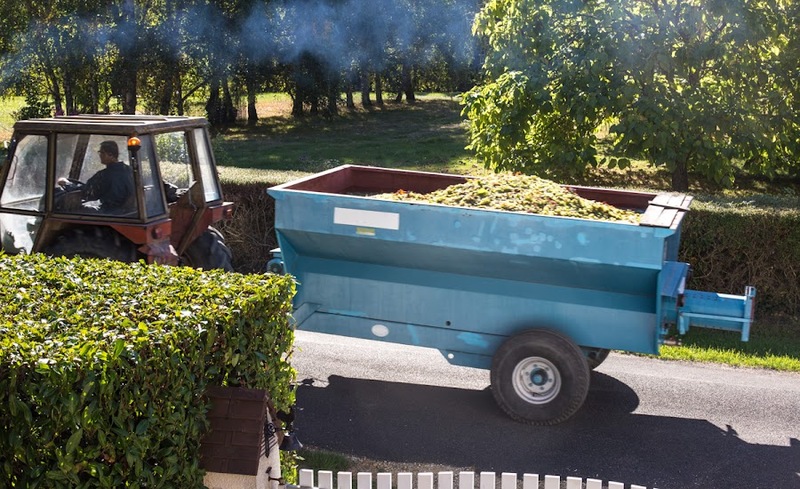 The last of the grapes in the vineyards around us are being picked, except for the late harvest whites. 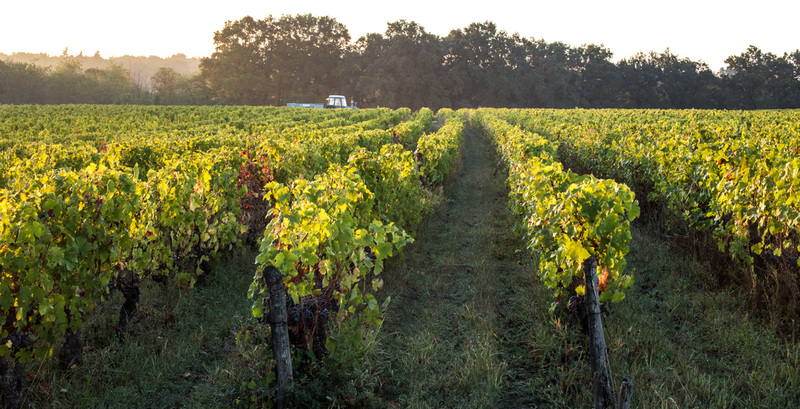 I'll bet the wineries all around smell of freshly pressed juice and the beginnings of fermentation. These grapes hadn't yet been harvested when I took this photo. They're gone now. We're expecting some nice weather so I need to get some stuff down out back to prepare for the assembly of the greenhouse. There's not much to do, but there are some things, including potted plants, that need to be moved out of the way. And we thought we'd rake up the stones in the path so the contractor won't have to do that before he starts leveling the ground. Not much going on right now. We're watching the season shift into fall. 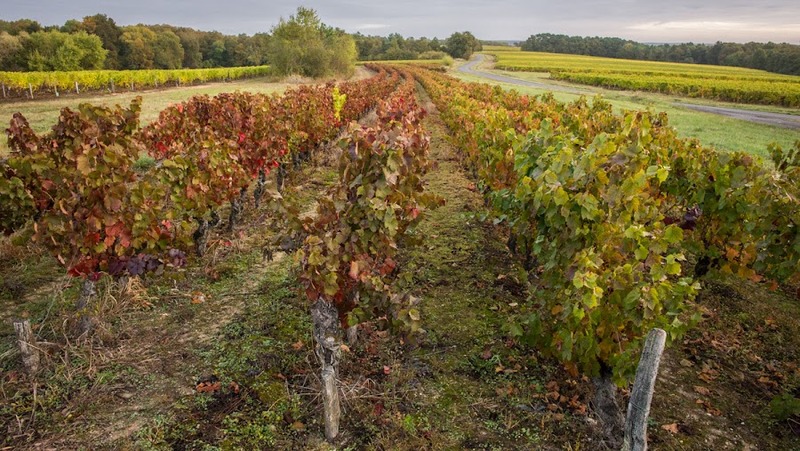 The grape harvest is nearly done, the weather is changing, leaves are beginning to turn. We're waiting for work to start on the new shower and the greenhouse. The greenhouse work is scheduled to start next Saturday. Weather permitting. Otherwise, the vegetable garden is winding down. Ken picked the last of the tomatoes, the pumpkins are close to being ready. We still have kale that we think will continue to produce for a while. 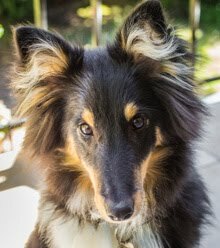 I want to make an appointment for Callie at the groomer's, then she needs to go to the vet for her annual shots in November. We've been having chilly mornings. The heat comes on and takes the chill off. On Wednesday I built the first fire of the season in the wood stove. I'm not sure it was really necessary, but it felt nice just the same. After today we're expecting a slight warm-up. 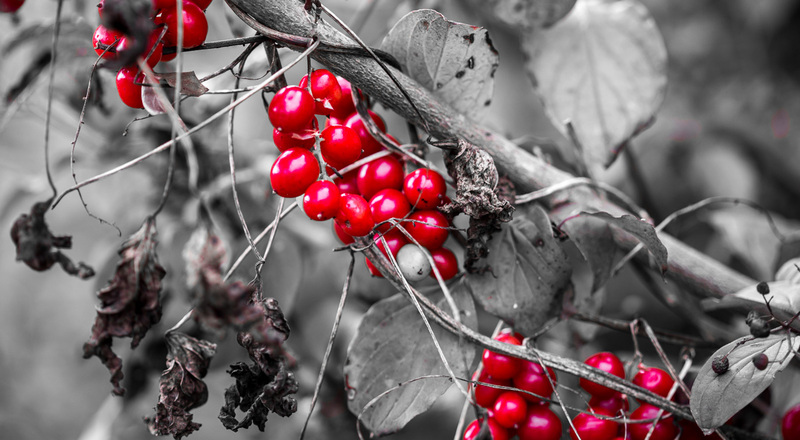 These red berries appear on the edge of the woods every year in the fall. On Tuesday morning while I was making toast, I glanced over at the toaster oven and noticed something peculiar: the heating elements were dark except for one small spot that glowed bright red. Then all the lights went out. The oven seems to have shorted out and it tripped the house's main breaker. I unplugged the oven and reset the breaker to restore power. No problem. So... we got rid of the toaster oven. We didn't like it much anyway, so we're happy it's gone. Ken ordered a regular pop-up style toaster on line and it should be delivered soon. A friend of ours gave us some figs from her tree. She said it's producing a lot of fruit this year and shared some with us, as she did last year. Ken stopped by her place while out running errands on Tuesday and came home with this nice box of figs. A box of beautiful fresh figs. Meanwhile, our little fig tree is producing its first edible figs this year. Our friend's offer prompted me to go out and see how they were doing. Lo and behold, there were at least half a dozen ripe figs ready for picking. 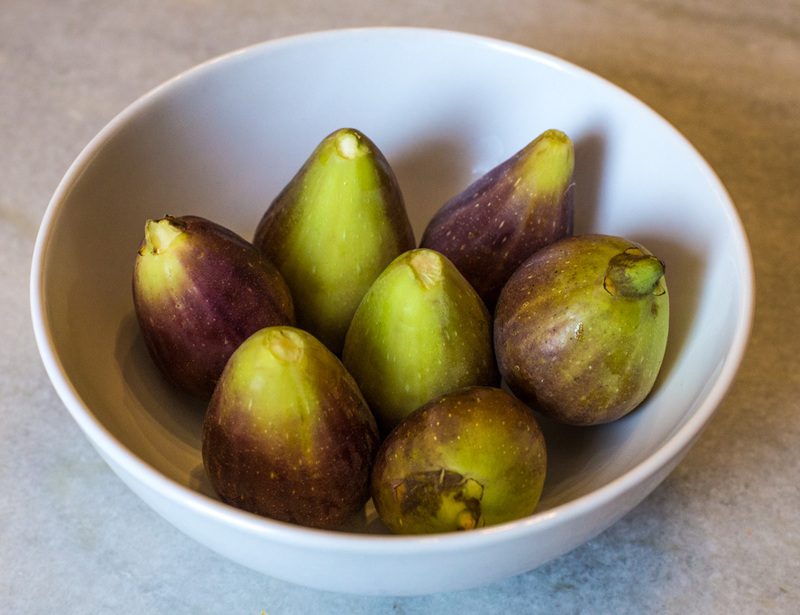 Our figs are a different variety from those of our friend, and are also different from the figs one of our neighbors grows. Figs from our own tree. 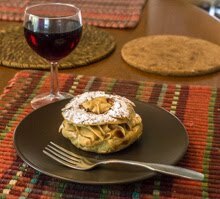 So, I cut up all of our figs and added a few of the friend's figs to make a fig tart yesterday. Today, Ken plans to preserve the remaining figs by cooking them in a syrup and freezing them. They'll be great through the holiday season with foie gras and other traditional dishes. 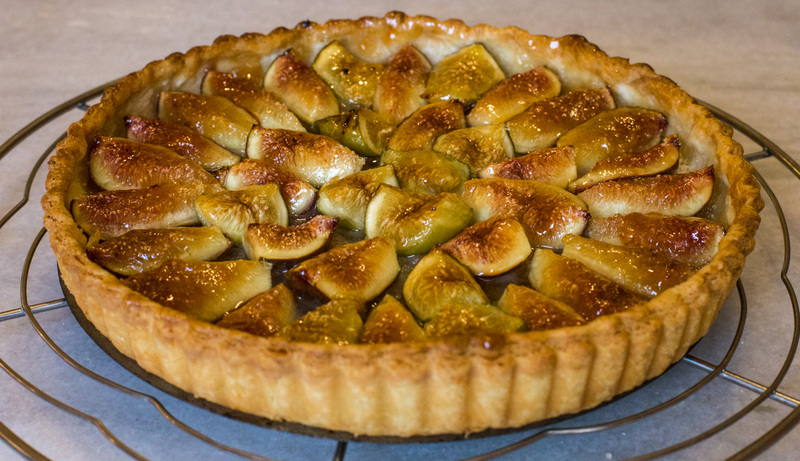 A fig tart, fresh from the oven. The red grapes are being picked now, at least the ones outside our back gate. The harvesting machine was out there Monday afternoon and, when I took my evening walk with Callie, I could see that a big parcel of red grapes was picked clean. There's still another parcel of red grapes to the north of our house, but I'll bet that will be harvested soon. Looking west out near the end of our dirt road to the vineyards beyond. This photo is of hand-harvesters out a mile or so west of our house. I took it about two weeks ago when the harvests were getting started. Now it's almost done. And, speaking of harvests, I picked about a half-dozen figs from our tree. You might remember that this is the first year that we've actually had edible fruit on the fig tree. After ten years or so (and after having been frozen to the ground one year), the tree has finally matured into what I hope will be a producer for years to come. And the figs are delicious! I never got around to planting these in the ground, but I'm happy they came up again in their pot. I promise I'll try to get them into the ground once they've finished flowering. I did a little internet research to be sure that's the right time, but I didn't find anything definitive. Colchiques dans les prés, fleurissent, fleurissent; colchiques dans les prés, c'est la fin de l'été. From what I can tell, they are some kind of colchique (colchicum), commonly known as autumn crocus (there's a label in the pot that says "yellow colchicum." Most of the examples of this plant I found on the internet are wild and flower before leaves are visible, but this one put its leaves up before the flowers, so I'm a little confused by that. 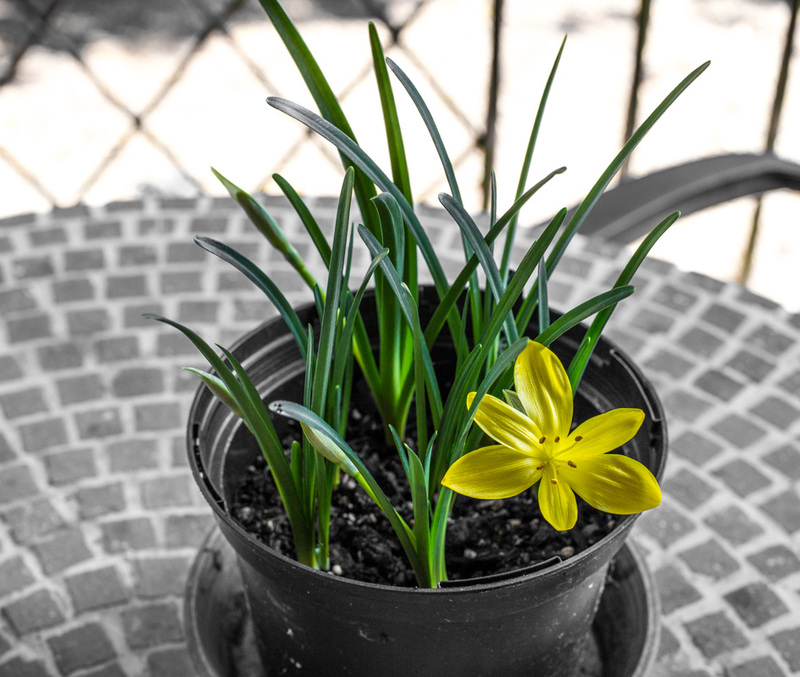 Colchiques are not true crocuses and should not be taken for saffron-producing flowers. These are highly toxic if ingested. 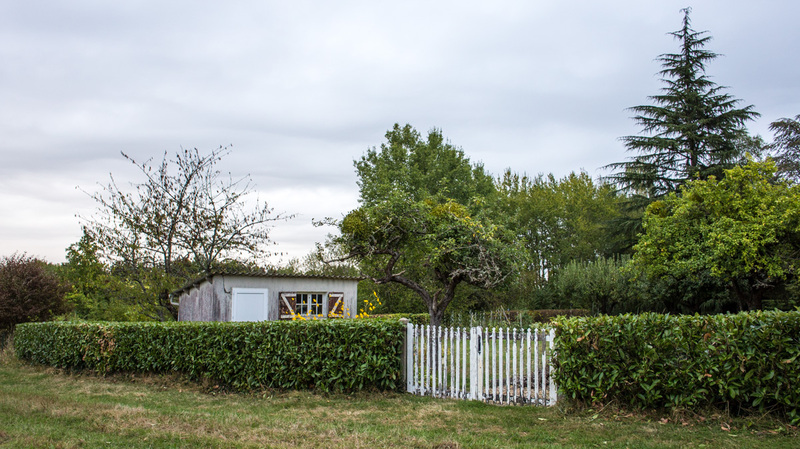 This gate out among the vineyard parcels blocks vehicular access to the artsy organized neighbor's property. Just beyond the gate is the little road (that disappears down into the ravine to the south) and the path through the woods that Callie likes to walk. There are also stacks of logs, piles of gravel, old roof tiles, discarded roadside bollards, and disaffected construction equipment among the trees to the left of this spot. The metal gate replaced an old chain that was strung between the posts. The red tape is a more recent addition to the collection. You can just barely see, under the tape just in front of the woods, an old roadside reflective post, one of eight or nine installed in a line through the woods. This past spring we noticed a lot of activity back there. Big tractors and trucks seemed to be moving earth. Indeed, a huge amount of landfill dirt and gravel was laid down and graded, resulting in a large level area where the dirt road dives down into the ravine. Then it all stopped. It's unlikely that anything will be built there and we have no idea what purpose it could serve. It's as if this kind of thing is his hobby. We've also noticed that old roadside reflective posts have been installed at intervals through the woods. Very strange. The central heat came on Friday morning. Or, more accurately, it tried. There was some kind of error and the system shut itself down. I pressed the "reset" button and all returned to normal. I have the thermostat set low right now, at 17ºC (62ºF). As the days get colder, I'll eventually nudge it up, but by then I'll probably be building the daily fire in the wood stove, so the heat will just be on in the mornings. It still looks like summer, but the mornings definitely feel like fall. This morning is a little warmer and, while the system started up normally, it hasn't had to provide much heat. Pretty soon we'll have to shut the whole thing down for a day or two while a new towel warmer radiator gets plumbed in. We'll keep you posted on that. This is our garden shed. Aside from the fact that the inside needs to be emptied, cleaned, and reorganized, the outside could use a little work. Especially the shutters. They're real shutters and I do close them in the winter, but they need to be taken down, scraped and sanded, and repainted. Yup. The cracks in the walls should be patched, too. Those are also real spider webs in the window. Very appropriate for this time of year, but otherwise not so nice. They cover everything inside, too. This is where we keep the lawnmower, the garden tiller, shovels, rakes, and all kinds of other things for and from the garden. We had a new door put on many years ago. The original door practically disintegrated before my eyes when we arrived. I've cleaned out the shed several times over the years, but not recently. Now it's getting too cold to do it this year. Maybe next spring. Callie and I walked by the harvesters on Wednesday morning. They were just arriving and getting under way when we went by. Callie knows most of the people, but she doesn't like the big machines. Still, she was a good sport and said hello to some of the workers and then got out of there pretty quickly. Harvesting under way as the sun rises. The harvesters spent the morning out there working, and then around lunch time they headed home. I got a photo of the haul as the grapes were taken back to the winery for crushing. It won't be long before this is all over for another year. It's fun to watch the harvest and even more fun to taste the result. The harvested grapes head to the winery, seen from the deck. The grape harvest continues out back, but there is no apparent hurry. The weather continues to be dry and (relatively) warm. We've seen a lot of hand-harvesting this year, much more than I've seen out there in the thirteen years we've lived here. 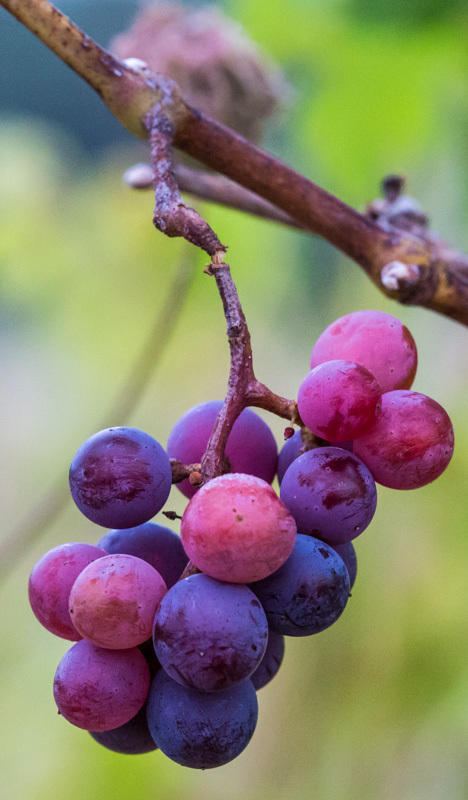 A small bunch of grapes in an abandoned vineyard parcel. These will go to the wildlife. One of the guys we've come to know over the years was out back when I walked Callie yesterday and we chatted briefly. He said that more and more growers are getting into organic production and hand-harvesting these days. It's the trend, although his employer is not following it. They still use chemical herbicides to keep weeds down in many of their parcels and rely mostly on mechanical harvesting. At least not at our place. Normally, our apple trees have an abundant crop every other year. The off-years still have apples, just not as many. I've forgotten where we are in the cycle, but two things happened earlier this year that had the effect of virtually eliminating our crop this year. First, we had two of the trees severely pruned. I'm thinking that it will take them a season to recover. Second, and more importantly, there was bad weather around the time the trees bloomed and I think that had an impact on pollination. Only a few trees in the whole neighborhood have fruit this year. 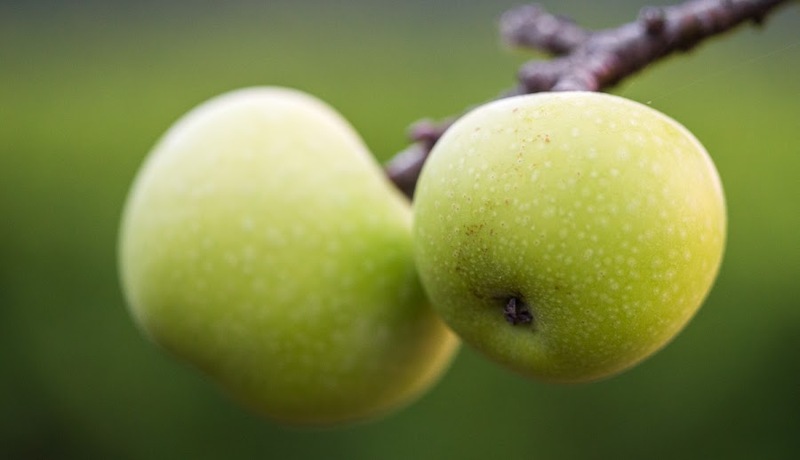 These apples are on a small tree out by the vineyard. It doesn't belong to us. I've really enjoyed not having to pick apples up off the ground each time I cut the grass this past summer. That gets old real fast. But, on the other hand, we have no apples for pies or sauce. I'm sure that the apples will be back next year. Those two pruned trees will probably bounce back with a big crop, provided the blossoms aren't damaged by weather. In French, a praying mantis is called une mante religieuse. I saw this one on the deck Saturday and tried to take a few photos. Most of them didn't come out well as the mantis was moving pretty quickly through the geraniums before it took off. But this one isn't bad. 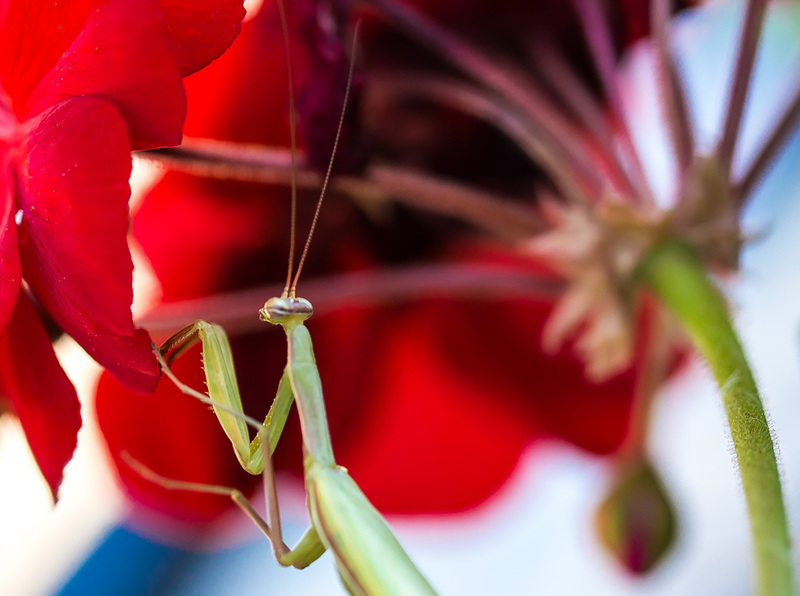 The mantis spent a total of about one minute climbing through the geraniums before flying off the deck. It wasn't very big as mantises go, so I wondered if it was a juvenile. It probably wasn't, though, because I read that the mantis' mating season is August through October, which is now, with the eggs not hatching out until spring. So this one was likely on the prowl for a mate. When we bought our house, there were three flowering shrubs in the yard that the previous owner told us were called althéa. Two were growing out by the real fake well and they had pink and purple flowers. The third was on the other side of the house and it blooms white. I removed the two shrubs by the well and left the white one by the garage. 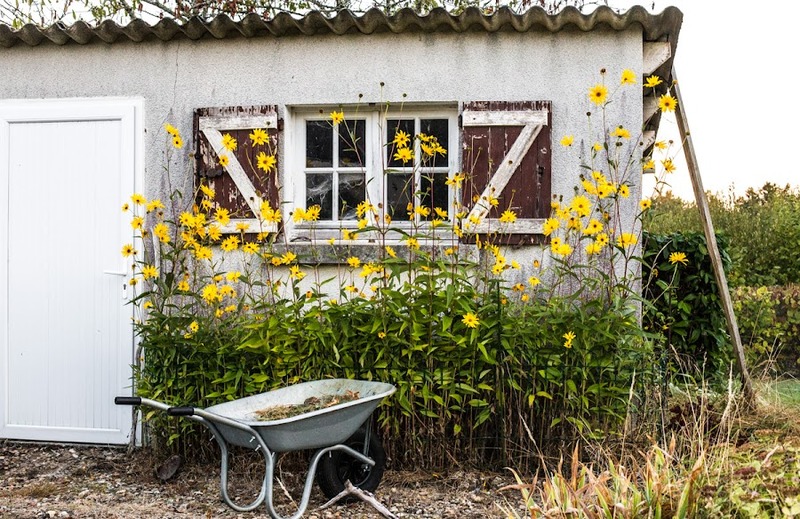 My extensive quick and dirty internet research tells me that while althéa is the vernacular name for these plants in France, true althéa are different plants. 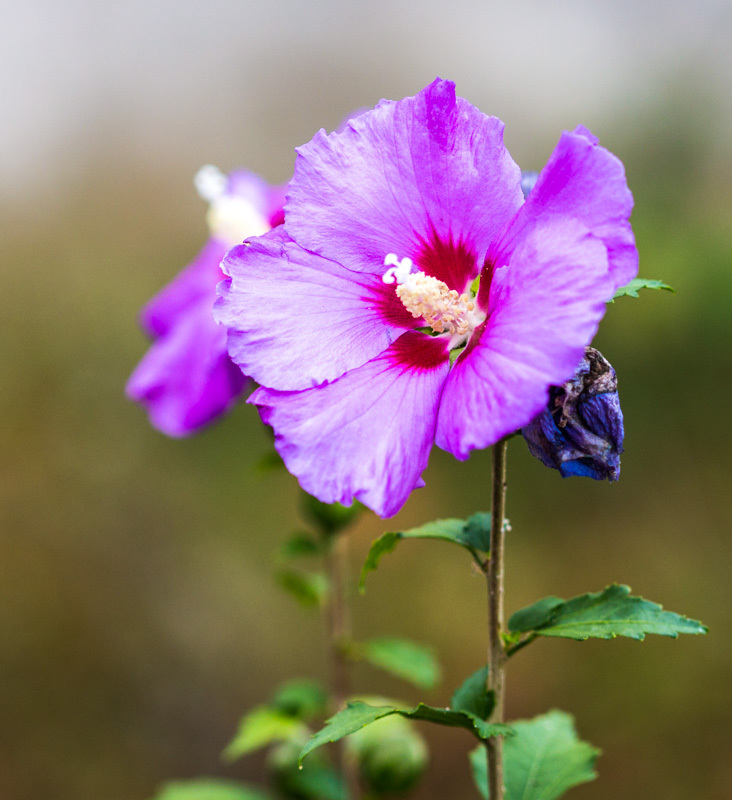 These are hibiscus syriacus, known as "rose of Sharon" in the US. This one is currently blooming in a neighbor's garden and is close to the color of the two that I removed all those years ago. I removed them because I didn't like where they were growing. I didn't think about transplanting them, but I don't know if that would have worked. I hate to keep harping on the hedges, but they are a big part of our property, surrounding us on all four sides. They grow every year and need to be kept under control or they'll get very unruly very quickly. They are very tall, about seven feet at their tallest, and very wide. The tallest and longest section of hedge separates our back yard from the road. The grass is still very brown. Many of you know that I used to do this myself. It took a couple of weeks, and I teetered on a ladder to do the tops. Then one year I delayed trimming (I hurt my neck painting the attic loft) and when I finally got around to doing it, the stems had thickened considerably. I proceeded to hurt my back bending and reaching and forcing the trimmer through the thicker stems. I realized that the job was bigger than I could handle any more (I ain't gettin' any younger), and we hired a landscaper to do it the following year. Another section of the tall hedge seen from kitchen window. Now the landscaper does them every year. 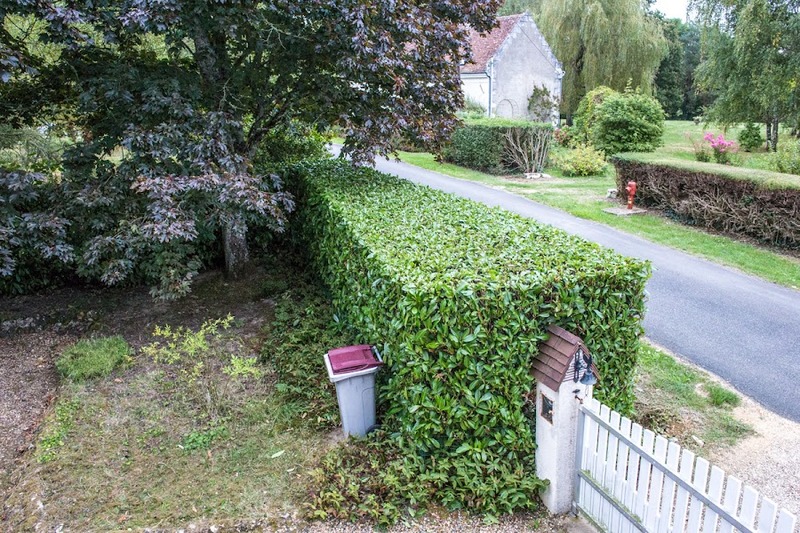 One year I asked him to cut a significant portion of the hedge down to a more manageable height. I've kept it tall along the road, but the lower height elsewhere has improved our views out to the vineyards and opened up parts of the yard to more light. Plus, it takes less time and effort for the landscaper to trim the lower sections. 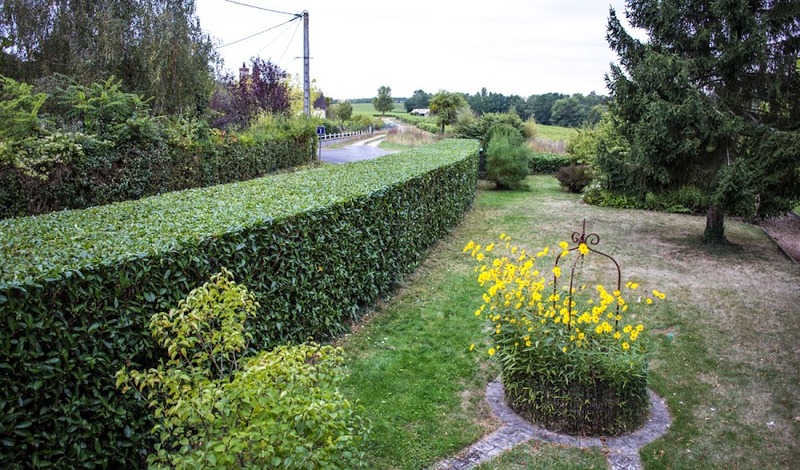 The hedge along the north side is made of hazelnut trees, cut down to size to form a hedge. The other benefit of having the contractor do the work is that his crew rakes up and carts away the trimmings. That's something that Ken and I did ourselves before. It was always a challenge to get rid of them; some of them went into our compost pile, some got burned, and some just got dumped in the nearby woods where they naturally decomposed. If we had a trailer (like so many people seem to around here) we could have loaded them up and taken them to the dump. But we don't. The now shortened back hedge, seen from outside our yard. It used to be twice as tall. So, I'm very happy that we found this landscaper. His crew does a great job and they're friendly and efficient. Last year they pruned our apple trees, and I know there are other jobs we'll be asking them to do over the coming years in addition to the annual hedge trimming. 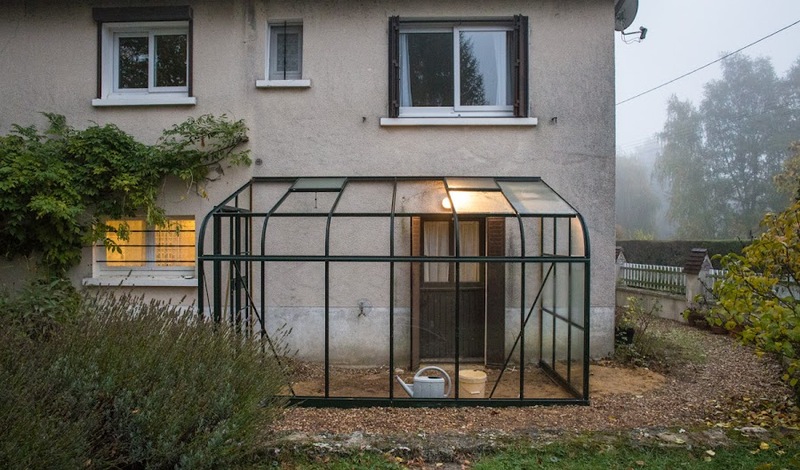 In fact, one of the guys will be assembling our new greenhouse later this month.